Motorcycle Ornament Lawn Address Sign - - personalized two-sided address plaque with either one or two lines of personalization and a snappy motorcycle ornament on the top. Made in America. The same lettering appears on both sides of this personalized address plaque. Each line holds up to 17 characters including spaces. Raised white lettering on baked satin black background. Includes two 24" lawn stakes. Dimensions one line sign: 14.75"W x 3.25"H.
Dimensions two line sign: 14.75"W x 4.75"H.
Ornament colors: gold bronze, swedish iron, burgundy and chrome, and black and chrome. Custom made for you. Please allow 2 to 3 weeks for delivery. 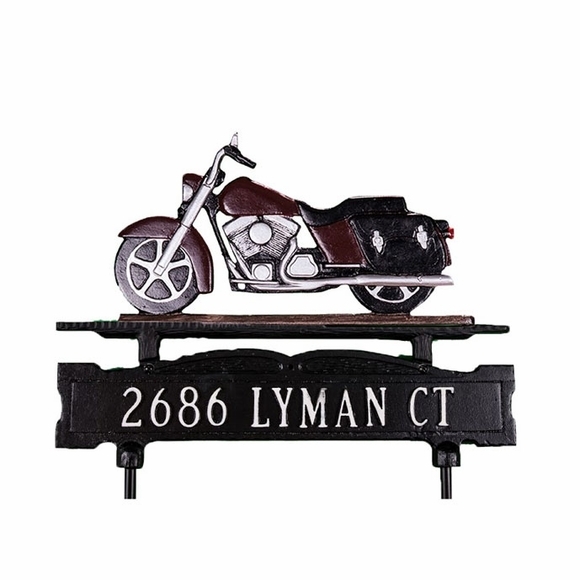 Lawn mount personalized 2 sided address sign with a motorcycle ornament and lawn stakes.